Zero Tolerance has hit the ground sprinting this year, collaborating with acclaimed designer Gustavo T. Cecchini of GTC Knives to create the Zero Tolerance 0055, which debuted at the 2017 SHOT show. 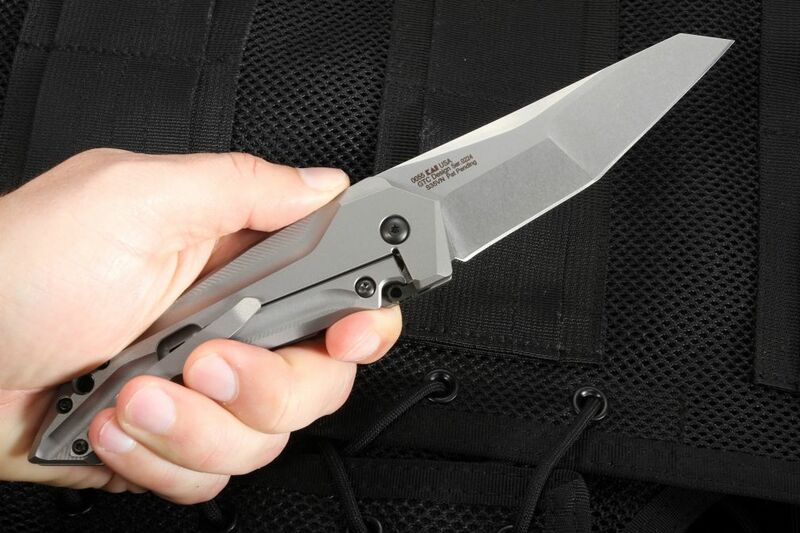 One look at this knife is enough to prove that the collaboration really has gone airborne. We, of course, refer to those aggressive stealth bomber angles and planes, clearly inspired by the GTC Airborne folder, but the 0055 has taken Cecchini's genius to new heights. The result is a beautifully crafted knife with intense aerodynamic lines with a precision quality build - entirely made in the USA. The 3.75'' long, 0.16'' thick, compound ground tanto blade is made of S35VN steel, a rich alloy that resists edge chipping and promotes edge holding due to advanced Crucible Particle Metal (CPM) technology and a Niobium, vanadium, and chromium carbides ensure a strong, long-lasting edge. 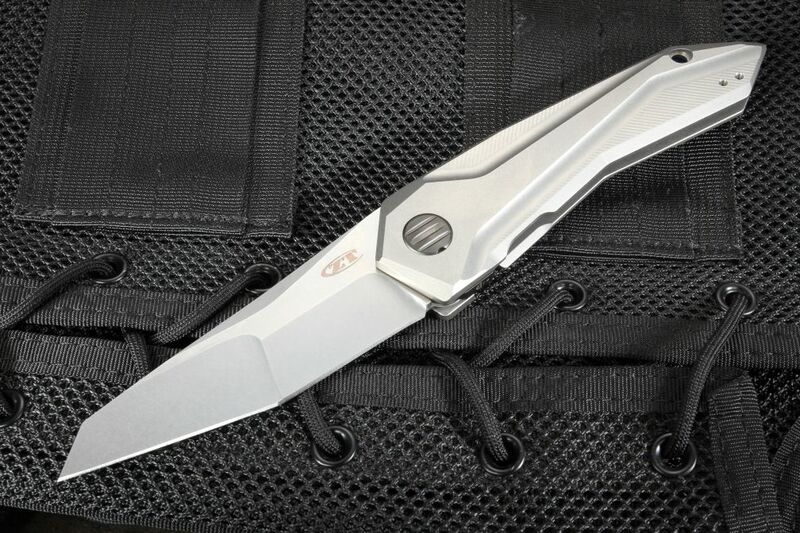 When combined with the CPM-S35VN stainless steel material, this knife performs with reliable cutting action and easily secures into the framework. Its angular looks are complimented by a compound flat grind and a fine stonewashed finish, while the tanto shape offers an unusually generous cutting edge. 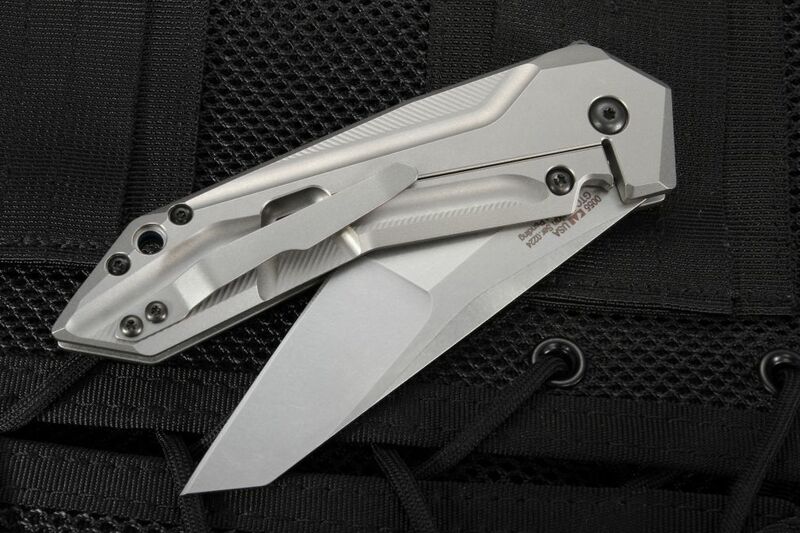 This flipper weighs only 5 oz. and has a frame locking system to secure the blade. 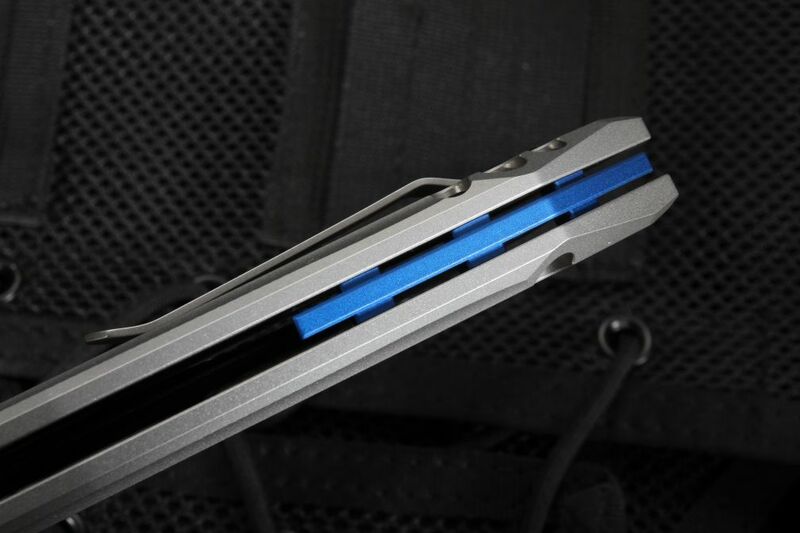 The handle features 3D-machined titanium scales that align with the open blade to form a lightning bolt-like profile. The gray is set off with a touch of color by a sky blue anodized aluminum backspacer. The precision KVT ball-bearing pivot system produces an effortless action, complimented by Cecchini's signature Spring-Loaded Tab (SLT) feature, which allows the draw tab to lie flush with the spine when not in use. 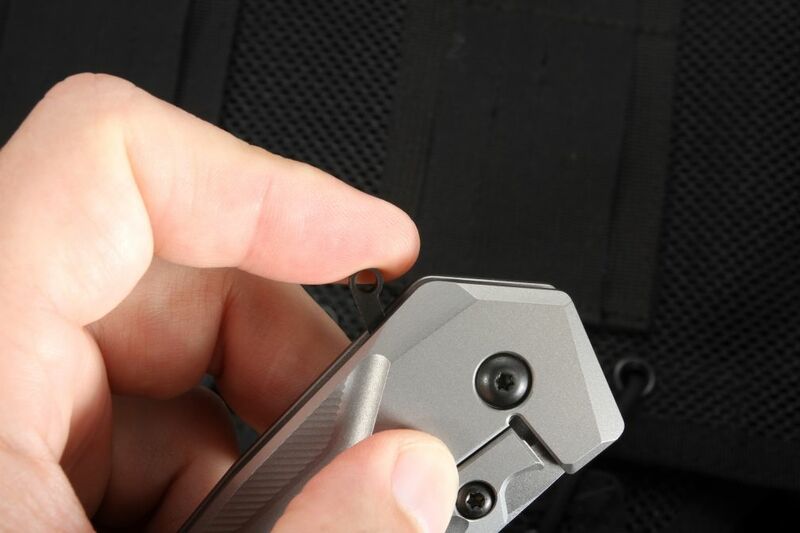 The SLT spring-loaded tab is concealed when the knife is closed but is quick to release when you pull back on the SLT. The hidden tab adds to the sleek, smooth design without interfering in handling or usage. Lanyard hole in the handle. 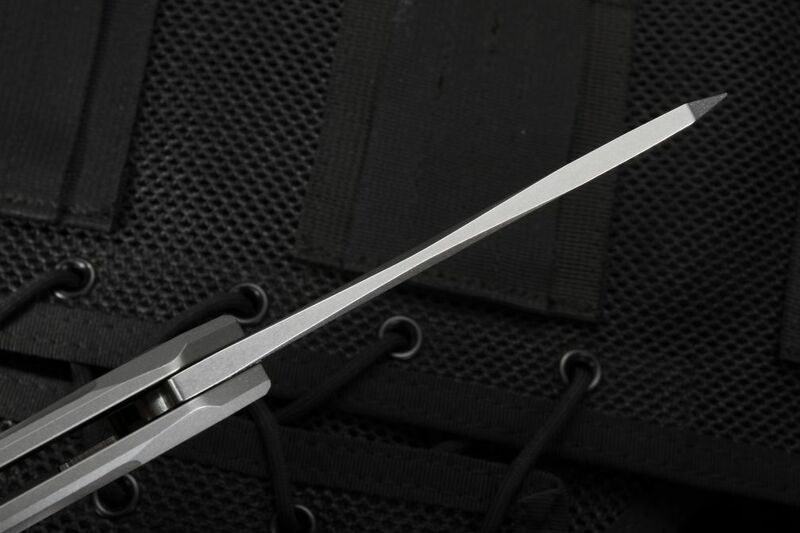 A reinforced titanium frame lock with a steel lock bar insert secures the blade open, and a reversible tip-up titanium clip completes the package. 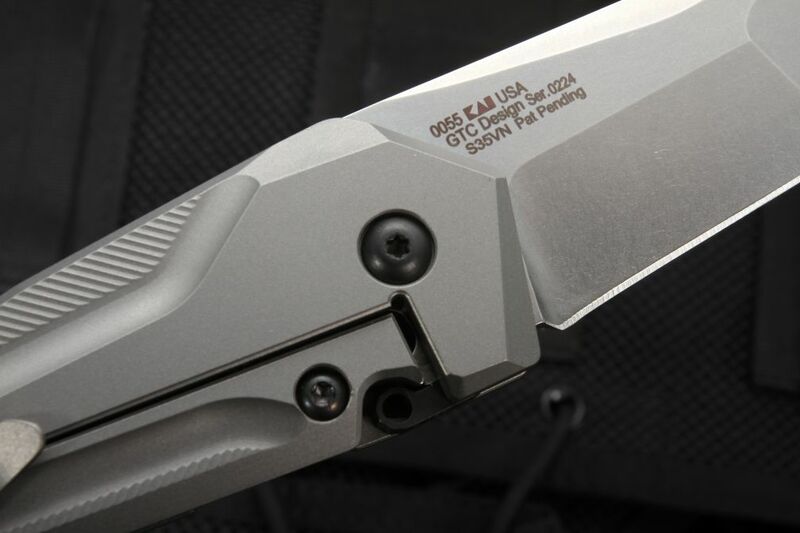 We are proud to offer this exciting American-made collaboration between Zero Tolerance and GTC Knives as a sign of good things to come, and we back it as always with our 100% satisfaction guarantee and easy return policy. As an authorized dealer, we offer free US shipping along with a no hassle return policy. This knife makes a great selection for those who appreciate well-crafted, uniquely designed cutting tool that features some of the most advanced engineering available on the market today. Like any frame lock, it won't open properly if you're pressing against the frame lock spring bar while trying to deploy. 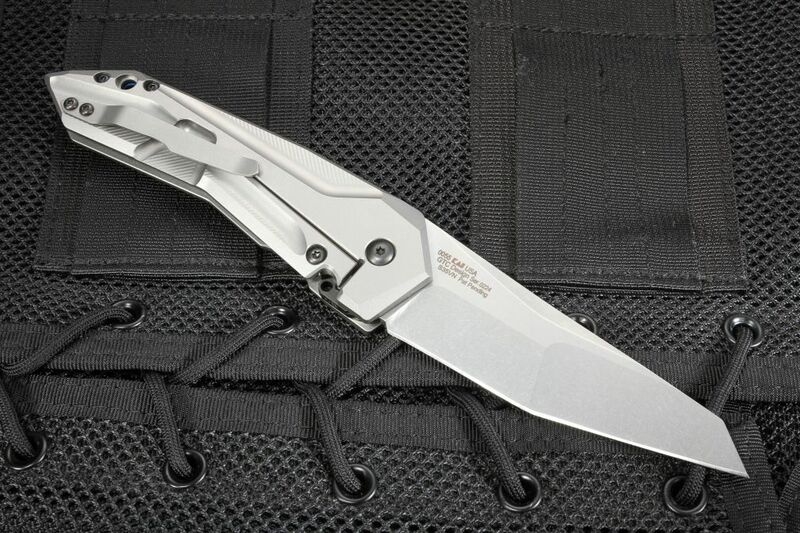 I've got several ZT's without any opening/closing/fitment issues, including this model. One of the best mass-produced brands I've experienced over 20+ years of collecting, including many customs! The knife is beautiful. Unfortunately, I found it impossible to open it. I returned it and ordered another knife of the same model, but confronted the same problem -- the thing can't be opened without two hands pressing against resistance. So, for the second time, I have returned it. I sent it back yesterday. While the item does not meet a proper standard of usefulness, the service provided by KA is responsive. I am pleased with the service; unfortunately, this particular product didn't work.